Not that there's any down side to it, but I have been sewing projects that were already started back in early November, and haven't cut any new projects though they are listed as "started" because their concepts are fully developed. I received packages from Craftsy and other companies that included a lot of fabric AND thread. 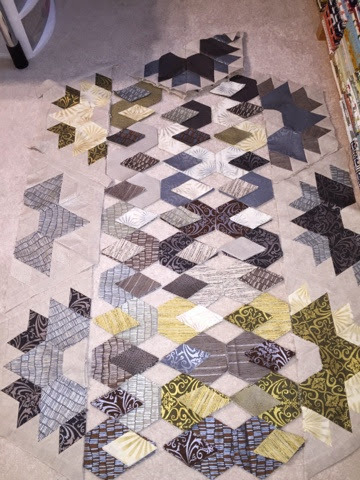 This was a photo texted to me from Constantine with the caption "quilting gone wild." 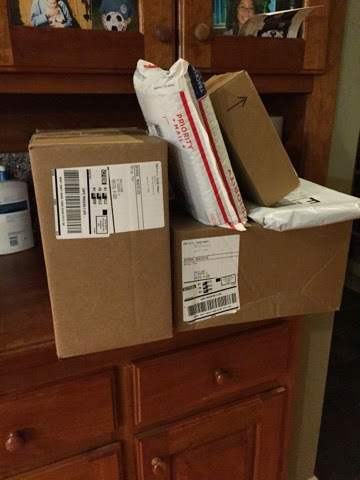 It's usually my plan to receive and open packages before he gets home but I won't become a wife who feels the need to conceal addiction. He's got his, too, believe me. If you knew how much thread I already owned, you would consider institutionalizing me. BUT these packages of thread are so incredibly beautiful and of such high quality and SUCH a great bargain that I indulged myself. Also contributing to my self-indulgence was Constantine, who said I should buy them, having no earthly idea what my current thread stash looks like. These threads are incredibly high quality but are very dear. Normally selling for $12.50 a spool, these were on sale for $84.50 each, which is admittedly still an outrageous $7 per spool, but oh! you should see the colors in person. $170 is about what an hour of therapy costs, and this is maybe 4 times the boost of an hour session. Welcome to my delusional world of rationalization. It's comfy here! I've cut the main pieces of my Day Break quilt. It's a monster king size quilt at this point since I want it on my bed, and for the first time, I actually care if it fits. This quilt is going to be a major production but it really deserves to be done up BIG.